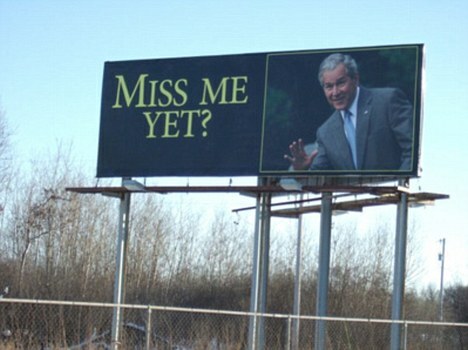 Miss Me Yet? And By “Me,” I Mean The Point. The press quickly revealed that the advertisement was the work of a group of small business people, apparently in protest against the current administration. But for the short time the sign’s origins and intent were in doubt, it was possible to debate the greater meaning behind those three words. Was Bush, with his snarky grin and cocky stride, supposed to remind us of the divisive eight years that began the century, in effect telling us that things could be worse? Or as it turned out, was it a snipe at the current administration by invoking time-softened nostalgia for the former president, still widely reviled in many quarters? The Decider or the Divider? Given the polarized nature of political discourse today, it’s likely that many people are in no ways nuanced in their feelings on this issue. When asked, “Miss Me Yet?” , they will no doubt respond in a loud affirmative or an equally bombastic negative. But for a smaller group, the question eludes such pat answers. By nature, the news media couldn’t let the message speak for itself–or rather, speak to individual interpretation. A mystery is an irritation for a journalist–a puzzle or riddle to be solved. This compulsion is by all measures a good thing. No one who values his or her liberty would have it any other way. However, the greatest strength of the 4th estate, this need to untie knots, can have unfortunate side effects. As in this instance, sometimes light kills the magic. For just a short moment, with the curtain down and the inner workings still a mystery, this prosaic amalgamation of metal, paper and ink became something akin to art. Then, in no time at all, the exotic mystery lifted up her veil and revealed to all the world what she was: plain old politics.